This review first appeared in the May 15, 1985 issue of The Daily Aztec. Guitarist Allan Holdsworth first came to our attention on an album by violinist Jean Luc Ponty. While Ponty always takes most of the spotlight on his albums, Holdsworth made his solo space worth listening for. 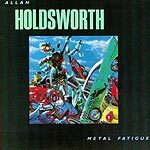 Unfortunately, on his own most recent solo album, Holdsworth still seems content to hide behind the band and not venture too far out front. The only exception to this rule is on "Devil Take the Hindmost." On this cut, Holdsworth really comes forward and takes control, playing measure after measure of breathtakingly fast arpeggios and broken chords. These passages show why everyone from Steve Vai to Eddie Van Halen credits Holdsworth as their inspiration on guitar. But elsewhere in the album, Holdsworth practically disappears, even on a song dedicated to his late father  on "The Un-Merry-Round," it's keyboardist Alan Pasqua who takes most of the leads, most of the solos. Holdsworth has the rep, and from a few glimpses of brilliance here, the chops to back it up. He just doesn't do enough on this album.